We finish our series looking at notable English Heritage blue plaques with a look at a plaque which not only commemorates a prominent Londoner but, unusually, also displays there for all to see the reason (well, an important part of it, anyway) for his prominence. 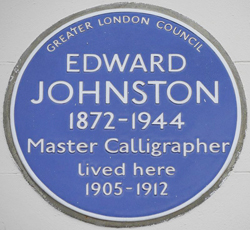 Yes, we’re talking about Edward Johnston (1872-1944), a master calligrapher who was not only credited with starting the modern revival of the art but is also noted for having created the famous Johnston typeface which he developed for London Transport in the early 20th century. In a lovely touch, the sans serif typeface he created is that used on the plaque – located at premises at 3 Hammersmith Terrace in Chiswick where he lived from 1905-1912 – itself. The plaque, which was erected on the building in 1977 by the Greater London Council, was the first to feature the typeface but isn’t the only one: in fact there are four, all of which commemorate people related to London Transport. The other three commemorated include Frank Pick (1878-1941), a London transport administrator who steered the development of London’s corporate identity – he’s commemorated with a plaque on his former property at 15 Wildwood Road, Hampstead Garden Suburb, with a Greater London Council plaque erected in 1981). They also include Albert Henry Stanley, Lord Ashfield (1874-1948), the first chairman of London Transport (placed on his former home at 43 South Street, Mayfair, in 1984 by London County Council); and, the most recent plaque commemorating Harry Beck (1902-1974), designer of the London Underground map (placed by English Heritage in 2013 on his former property at 14 Wesley Road in Leyton). Happy Easter! We’re taking a break over the Easter weekend…Our next update will be on Tuesday, 2nd April. • The Roman cities of Pompeii and Herculaneum are the subject of a major exhibition opening at the British Museum today. Life and death in Pompeii and Herculaneum brings together more than 250 objects from the two cities which were buried in just 24 hours during the eruption of Mount Vesuvius in 79 AD. 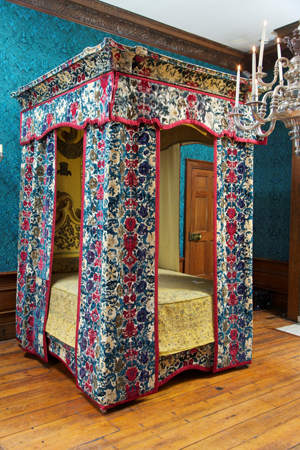 The objects include celebrated finds and recent discoveries, many of which have never before been seen outside Italy, and help explore what daily life was like for the inhabitants. Artefacts include a beautiful wall painting from Pompeii showing baker Terentius Neo and his wife, wooden furnishings including a linen chest, inlaid stool, and even a baby’s crib from Herculaneum, and casts of victims including a family of four and a dog who died at Pompeii. Runs until 29th September. Admission charge applies. For more, see www.britishmuseum.org. • Find out more about the history of chocolate at Kew Gardens this Easter, from the ritualistic use of cacao in ancient Mayan and Aztec cultures to the arrival of chocolate in 17th century London, where it was a luxury item for high society to indulge in at newly fashionable chocolate houses. Running from tomorrow until 14th April, there will be a range of workshops taking place at the gardens around the chocolate theme along with a traditional Easter Egg Hunt on Easter Sunday (31st March). The garden’s cocoa tree can be found in the Princess of Wales Conservatory. Admission charge applies. See www.kew.org. • Harry Beck, designer of the innovative first diagrammatic Tube map, has been honoured by an English Heritage blue plaque – inscribed in the Underground’s new Johnston typeface – at his birthplace in Leyton in London’s east. Beck, who was born in a small terraced house at 14 Wesley Road in 1902, was working with London Transport as a draughtsman in the London Underground Serial Engineer’s Office, when, in 1931, he produced his first design for a diagrammatic map. He continued to update the map with new stations and lines even after leaving London Transport with the last version of his map published in 1960. Beck died in 1974. Meanwhile, a blue plaque commemorating railway engineer Sir Nigel Gresley (1876-1941) has been returned to King’s Cross station following the completion of building work. It can be found on platform 8. For more, see www.english-heritage.org.uk/discover/blue-plaques/. • On Now: The Underground. A commission from Art on the Underground, this exhibition of artist Mark Wallinger’s work at the Anthony Reynolds Gallery (60 Great Marlborough Street) features some examples of 270 labyrinth designs – one representing each of the Underground stations – which are being installed at the Tube stations themselves. Among those stations represented at this showing are Westminster, St James’s Park, Oxford Circus, Victoria, Embankment, Green Park, King’s Cross St Pancras, Baker Street and Tottenham Court Road. While labyrinths are already in place at these locations, the remainder of Wallinger’s labyrinth designs will be appearing at Tube stations over the coming months. Runs until 27th April. For more, see www.anthonyreynolds.com. Apologies for the delay in posting this piece – next week we’ll post the final in this series! 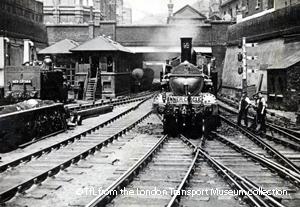 The first underground railway system in the world, the London Underground – fondly known as the ‘Tube’ – is this year celebrating the 150th anniversary of its creation. 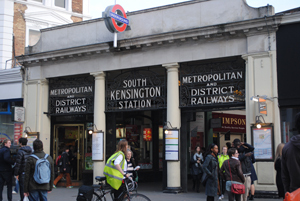 Born out of an idea to link the inner city with the various large rail termini on the outskirts, the first section of what is now the underground system – a six kilometre stretch between Paddington and Farringdon – opened on 9th January, 1863, and was run by the Metropolitan Railway, known less formally as the ‘Met’. It was constructed using the ‘cut and cover’ method in which streets were dug up and tracks laid in a trench before being covered by brick-lined tunnels and the street above replaced (the method was later abandoned, apparently due to the disruption it caused to traffic). The first trains were steam-driven locomotives and drew gas-lit wooden carriages behind them (the first journey was re-enacted earlier this year – see our earlier post here. Other events commemorating the 150th included a visit to Baker Street Station by Queen Elizabeth II, Prince Philip and the Duchess of Cambridge). The idea proved a success – 26,000 people used the new railway every day during the first six months of its operation – and the Metropolitan District Railway opened a new line between Westminster and South Kensington (station is pictured) in December, 1868, while the first Tube tunnel under the Thames, from the Tower of London to Bermondsey, opened in 1880, and what is now the Circle Line was completed in 1884. In December 1890, the world’s first deep-level electric railway opened, running between King William Street in the City and passing under the Thames to Stockwell. Ten years later the ‘Twopenny Tube’, more formally known as the Central London Railway, opened between Shepherd’s Bush and Bank (it was from this that the use of the word ‘Tube’ to describe the Underground system caught on). The uniting of the system began the following year with the creation of the Underground Electric Railway Company of London and by World War I, all but the Met were within a single group organisation. The name Underground first appeared on stations in 1908, the same year electric ticket machines were introduced. In 1933, the Underground came under the control of the London Passenger Transport Board – the same year that Harry Beck’s first diagrammatic map of the underground system appeared. Stations in the system were used as air raid shelters during World War II – part of the Piccadilly Line was closed and used as a storage site for treasures from the British Museum. Following the war, the organisation running the system went through various name changes until the formation of London Underground in 1985. The system has since expanded – the Victoria Line was opened in the late 1960s and the Jubilee Line a decade later – and now consists of more than 408 kilometres of railway lines and 275 stations which serve more than three million passengers a day – equating to more than a billion a year, the same as the entire national rail network. 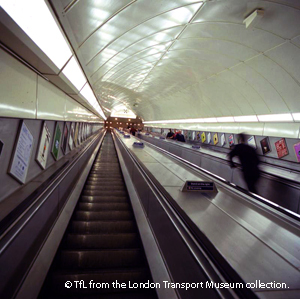 For more on the history of the Underground, see our earlier 10 Questions with London Transport Museum curator Simon Murphy. Poster Art 150 – London Underground’s Greatest Designs runs at the London Transport Museum until October. Admission charge applies. For more (including the many events around the exhibition), see www.ltmuseum.co.uk/whats-on/events/events-calendar#posterart150. For more, check out David Bownes’ Underground: How the Tube Shaped London or Andrew Martin’s Underground, Overground: A Passenger’s History of the Tube . IMAGES: Top: Steam engine at Aldgate (1902); Middle: Platform 2 sign, 1930s design; and Bottom, Angel Underground Station (1990s). 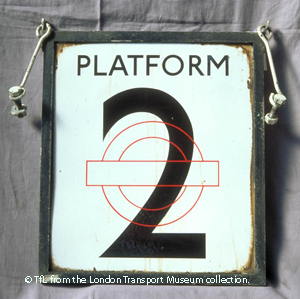 © TfL from the London Transport Museum collection. Poster Art 150 – London Underground’s Greatest Designs runs at the London Transport Museum until October. Admission charge applies. For more (including the many events around the exhibition), see www.ltmuseum.co.uk/whats-on/events/events-calendar#posterart150.